Collaborative Learning and iPads are a hot combination in K-12, colleges and universities. SMARTdesks reached out to a large conference of college educators with IT integration responsibility at the Campus Technology 2012 Conference held at the Seaport World Trade Center, Boston, MA, July 16-19. Attendees included administrators, executive IT management, instructional program management, top-level institutional executives and industry consultants. A highlight of the show was the giveaway drawing for ten iGroup Collaboration Tables. The iGroup and Exchange Collaboration Tables can be assembled to form flexible collaboration groupings that have creative flow. The process of making shapes are likened to the making of Origami, with table shapes that are like pinwheels, beetles, serpentines, maple leaves, hexagons, triangles, and wonderful abstracts. The iGroup is a sister product to the Exchange collaboration tables, which are scaled for use with flipIT workstations for PCs and laptops. The iGroup Collaboration Tables are smaller, scaled for use in smaller spaces for use with iPads, tablets, and mobile devices. The winner of the iGroup Giveaway was Bank Street College of Education, entered by Jeannie Crowley, Manager of Digital Media and Learning. Installation will be covered in a follow-up report. 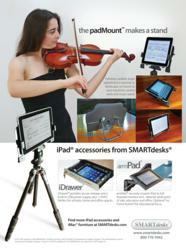 Introducing padMount: a self-standing tripod mount for iPads and tablets. iPad is held in either portrait or landscape at an infinitely variable screen angle for free-hand screen viewing or keypad support. Perfect for office, classroom, meeting room or studio, the padMount can also be mounted to a personal tripod to facilitate the use of camera and video functions, or for use as a music stand. iPad on a monitor arm! 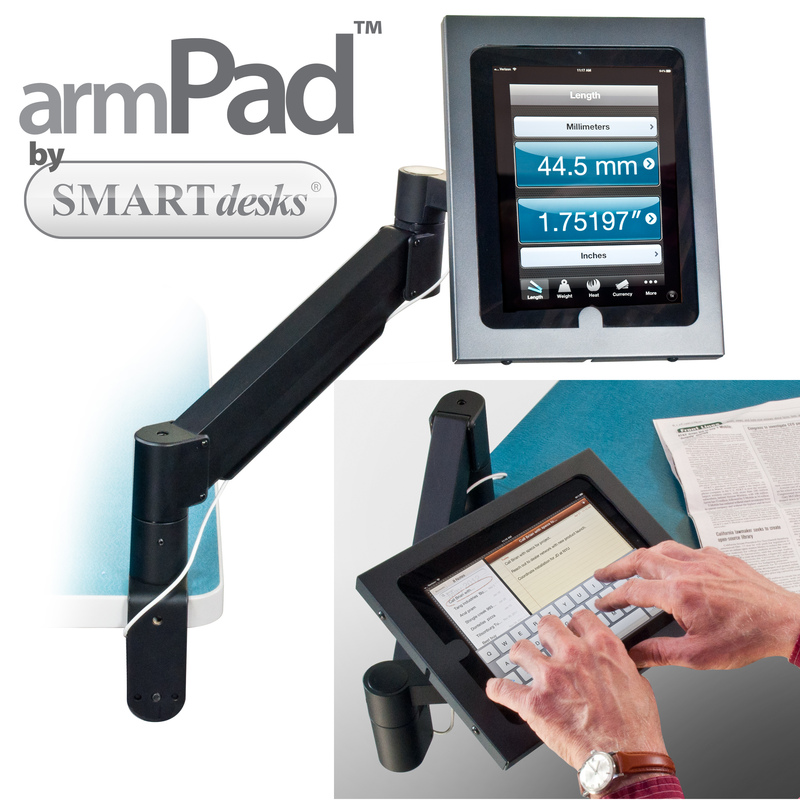 The armPad, by SMARTdesks, lets users securely mount their iPads to a full-featured monitor arm. Position the iPad for hands-free use, standing or sitting, portrait or landscape. Free-up usable workspace, positioning the screen as a return. Ideal for instructors, presenters, and point of sale stations in retail. For classroom use, a “no home button” block-out tab keeps one app selected for use. The armPad keeps iPad connected to USB power for all-day use. 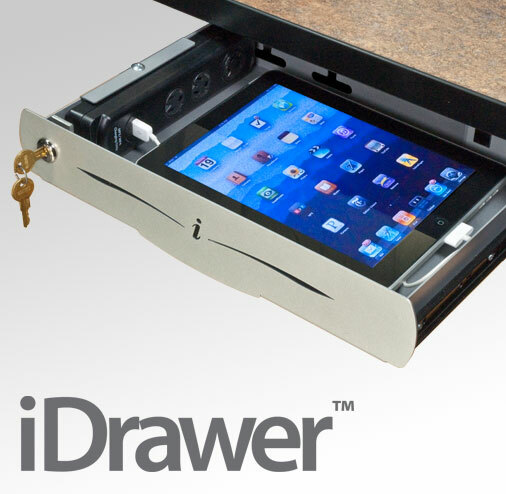 iPad Security for classroom and office: the iDrawer by SMARTdesks. Keeps the iPad securely locked under the work surface. In use, the iPad connects to iDrawer’s internal USB power source, which also features 110VAC for other devices and power converters. Fully vented with pads to protect the iPad from metal-to-metal abrasion, the iDrawer is styled to work with contemporary or traditional furniture. Can be customized with internal AV and data connectors as needed.